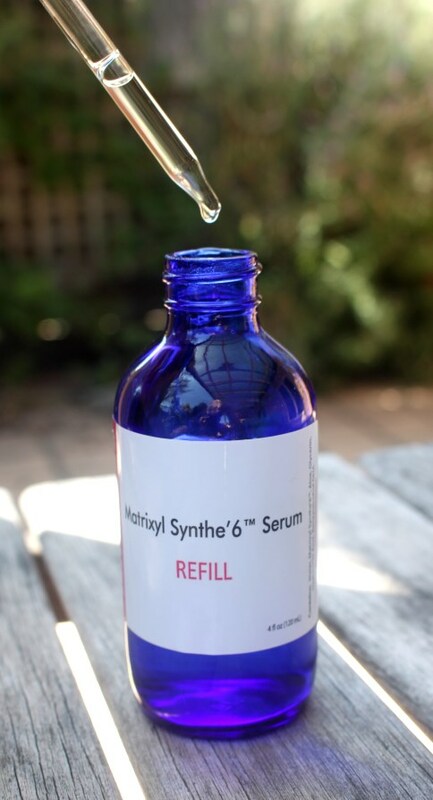 The Timeless Matrixyl Synthe’6 serum claims to be a powerful peptide that boosts six skin-rebuilding, anti-wrinkle essentials to help reverse the signs of aging. 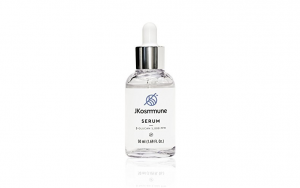 It achieves this by stimulating six major constituents of the skin matrix and dermal-epidermal junction. In doing so, it is said to even out skin and smooth wrinkles from the inside. Laminin-5 anchors the epidermis to the dermis and regulates keratinocyte migration, accelerating healing. It’s pretty much impossible to find independent studies on the effectiveness of Matrixyl Synthe’6, those in circulation being from Sederma, the manufacturer. Their results indicate that an application of 2% Matrixyl Synthe’6 over a five day period improved Collagen I by 111%, III by 104% and IV by 42%. Laminin-5, fibronectin and hyaluronic acid also returned significant improvements. 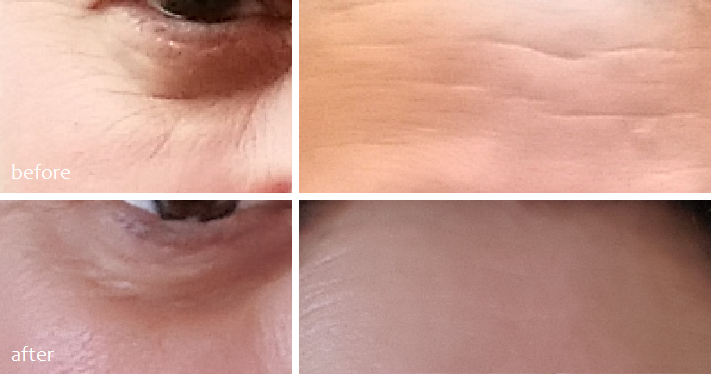 In terms of how this changed forehead wrinkle appearance, results recorded a mean improvement in volume of 31%, a 28% reduction in cutaneous roughness, and a depth decrease of 31%. The improvement of the appearance of crow’s feet was a measure of the decrease in the surface occupied by deep wrinkles, recorded at 28.5%, volume and depth decreasing by 21% and 15% respectively, with an approximate reduction in cutaneous roughness of 13%. Thus, the results demonstrated Matrixyl Synthe’6 delivered a visible smoothing of facial wrinkles in mere days, its effect similar to that of hyaluronic acid and collagen injections. Hyaluronic acid is commonly found in many skin care products due to its powerful hydrating and moisturizing effects. It is said to hold up to 1000 times its weight in water. The Timeless serum contains a 1% concentration. Also in the formulation are aloe, glycerine, benzyl alcohol and DHA. Aloe vera extract exhibits soothing properties and serves as a hydrating agent for skin. Polysaccharide is the active ingredient in aloe vera, an antibacterial substance that helps to kill fungi and bacteria whilst accelerating cell reproduction. It is highly effective because it penetrates the dermis four times faster than water. Glycerin is a humectant that’s present in all natural lipids. It is found naturally in the skin, commonly used as a skin-replenishing and restoring ingredient which helps establish normal balance and hydration. Benzyl alcohol is a preservative, considered safe and not likely to cause dermal toxicity or skin irritation or sensitization at the (approved) concentration of <1%. Studies indicate that it is not believed to be a carcinogen or a developmental/reproductive toxin. Finally, DHA (docosahexaenoic acid) is a long-chain omega-3 fatty acid considered particularly useful at treating dryness, eczema, and psoriasis and can accelerate skin wound healing through anti-inflammatory activity. 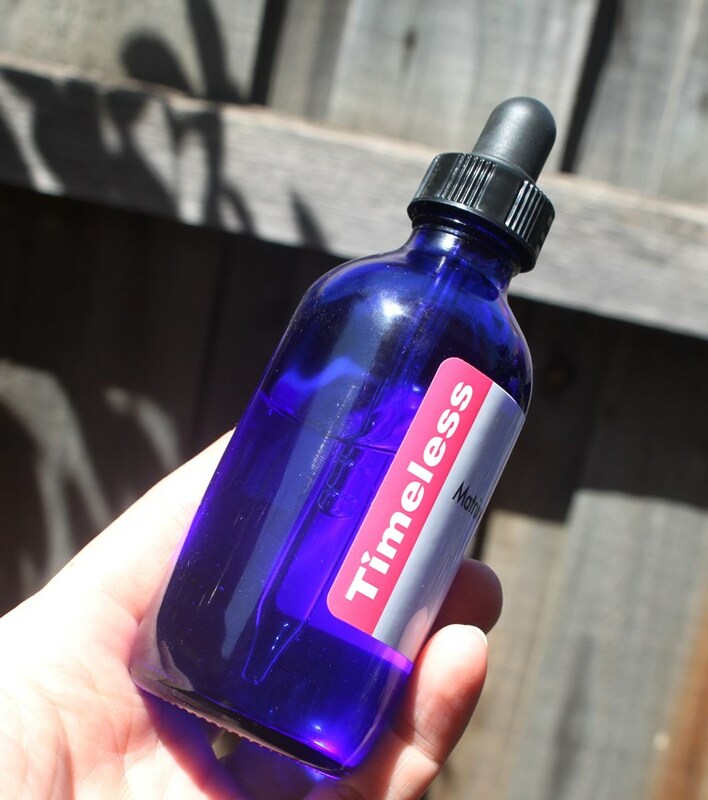 TheTimeless Matrixyl Synthe’6 serum is presented in a blue screw top glass bottle with a dropper dispenser. The inclusion of Benzyl Alcohol as a preservative, raises the only red flag in both the CosDNA and EWG reports, ultimately causing the return of a low hazard classification. Apply 2-3 drops to fingertips and smooth onto cleansed skin morning or night. The serum has a very faint smell of almonds likely from the benzyl alcohol. 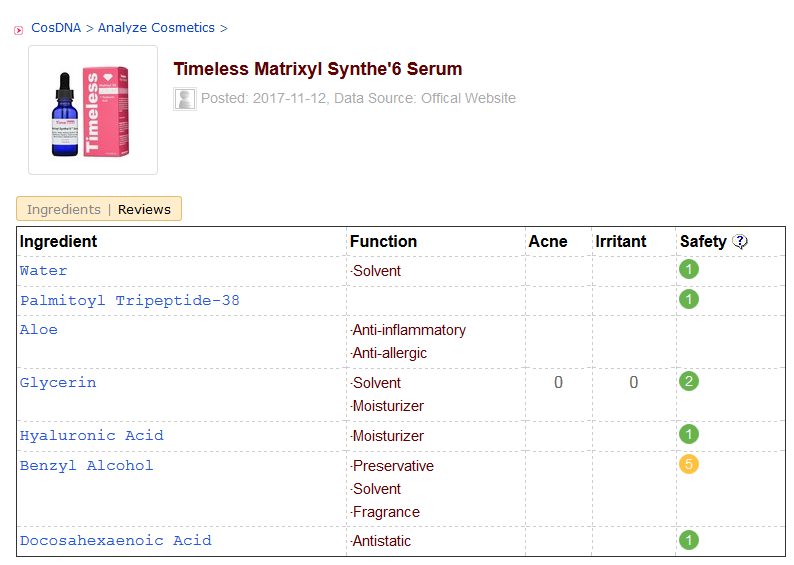 The 30ml bottle of the Timeless Matrixyl Synthe’6 serum retails at US$24.95. Shipping to Australia varies from around US$13.00 (First Class International) to US$44.18 (Priority International). 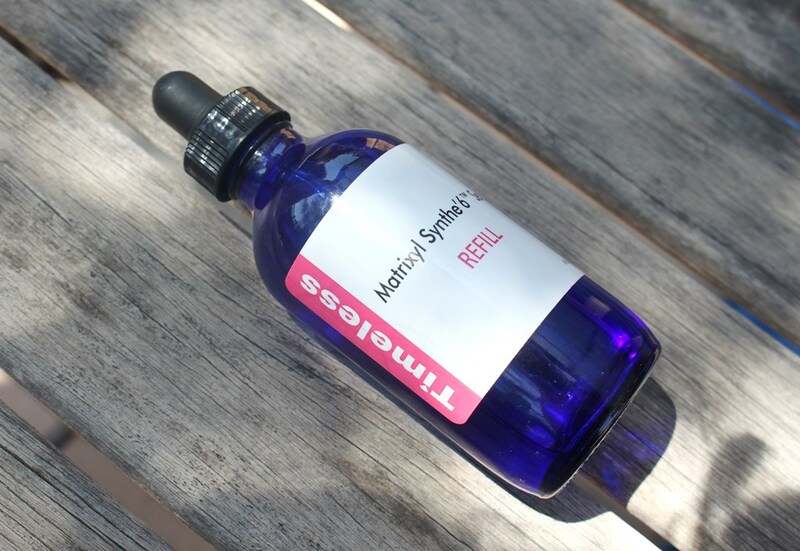 The 120ml refill bottle sells for US$64.95 with shipping to Australia between US$21.00 – US$44.18. Timeless also offer multi-purchase discounts. 10% discount applies when you purchase 2 items, 20% with 3 and 30% with 4 or more items. They also offer frequent sales so it’s worth getting on their email list or catching them on social media for alerts. The Timeless brand is available from their online store and also from third parties such as Amazon. I only buy their products direct as they stamp the manufacturing date which is always very current, ensuring you can enjoy products for their full shelf life. The serum has a two year lifespan. 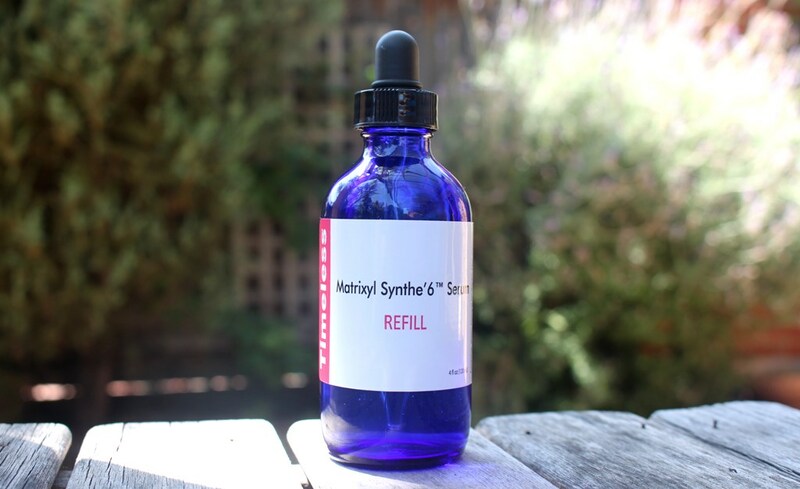 The Timeless Matrixyl Synthe’6 serum is a colourless liquid, slightly more viscous than water. It it fast drying, non-greasy and non-sticky. 2-3 drops will cover the face and neck sufficiently so a little goes a long way. The scent is barely detectable and I would go so far as to say negligible. The dropper provides an easy way to dispense the correct amount of serum per application and the tinted glass bottle protects the serum from light degradation. In my 40’s, fine lines and wrinkles have certainly started forming and I decided six months ago that I needed something to combat them, particularly since I have very fine (although not sensitive) skin. I did a fair bit of reading in my search for the right potion! Anyway, I discovered this serum which I have consistently been applying after toner every evening for around five months now. (I actually complement this with the Timeless CoQ10 serum in my morning routine, however this lovely liquid I will keep for another review). The Matrixyl Synthe’6 is a lightweight layer that is hardly noticeable within an established routine. It absorbs quickly, initially leaving a tacky feeling on the skin surface which dissipates after a few minutes. It’s formulation is very friendly and unlikely to conflict with any other layers or makeup application. As gentle as that sounds, its results pack a mighty punch. The lines that had formed on my forehead and under my eyes and crow’s feet were in fact becoming quite a concern. They were getting deeper and more obvious with the years. After using this serum for around 3 months, very noticeable changes started happening to my skin. And now, well, the photographs above clearly demonstrate these same lines are significantly reduced, the skin clearly looking more plump, smooth and youthful. I am thrilled with the results. In testing another item, I stopped using this serum but only on the left side of my face, so I could gauge the anti-ageing effects of the trial product. Within a few weeks, the lines on the left where the alternative product was applied, started to become more prominent whereas the right side retained its smoothness. This clearly indicated that the achieved effects of line softening can only be maintained by continuous use of the serum. Stopping takes you straight back to square one. No surprise really, as it is doing things for your face, that your skin is no longer capable of achieving. Taking that power away leaves your skin to fend for itself with a depleted arsenal in comparison to that of our youth. Since this liquid is good for two years, I only buy the refill bottle as it’s much more economical. Daily application should last around 12 months, which converts to a US$5.40 investment per month for more youthful skin. Although the shipping to Australia is quite pricey, it’s still worth it! I enjoy several of the Timeless products, so I usually order periodically when I need a new supply of Vitamin C, purchasing a few items at a time. If you’re new to this product, I would suggest you try the small bottle and if you like it, buy the refill ongoing and continue to decant it into the 30ml bottle for easy daily use. 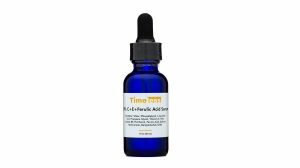 The Timeless Vitamin C serum is probably the most popular product from this brand and for good reason, it works. However, I find that the Matrixyl Synthe’6 serum is equally exciting. The benefits are clear and speak for themselves. I have no intention of taking this little wonder out of my routine.